Lay eggs and hatch their young. Check out the following websites to find out more about birds. Birds make their nests in all kinds of places, from trees, to shrubs, to nest boxes, to overhangs on your house, and even in your laundry vent. You can put wire to prevent birds from nesting on your house, and you should check for nests when you’re trimming trees or shrubs. If possible, wait till the birds are able to fly before disturbing the nest, which can take a few weeks. Altricial baby birds are born featherless and have their eyes closed. They require a lot of help from their parents, since they cannot walk, fly, or eat on their own yet. Most songbirds, like Robins, are altricial. Precocial birds are born with down feathers and their eyes are open, and they are able to walk and swim right away with their mother, and eat on their own. They still spend time with their parents, but they are less needy than altricial babies. Most water birds, like Mallard ducks, are precocial. It is illegal to try to care for baby birds without the proper permits from the federal government. If the bird is a non-native species like a House Sparrow, Rock Dove, or European Starling, it is not protected, but it is very hard to tell what species a baby bird is when they are that young. If you find a baby bird that is definitely injured, or are sure the mother is dead, call a wildlife rehabber and ask to see if you can bring in the bird. Put the baby bird in a box with a warm rag, in a dark, quiet spot in your house, away from kids and pets, until you can bring the bird in. Make sure there is a lid on top, and ventilation for the bird to breathe. Do not try to feed or give water to the bird unless instructed to do so by a rehabber, as you can cause more damage by accidentally choking the bird. If you find a nestling out of the nest, you must assess the situation. Children should always get an adult before doing anything. 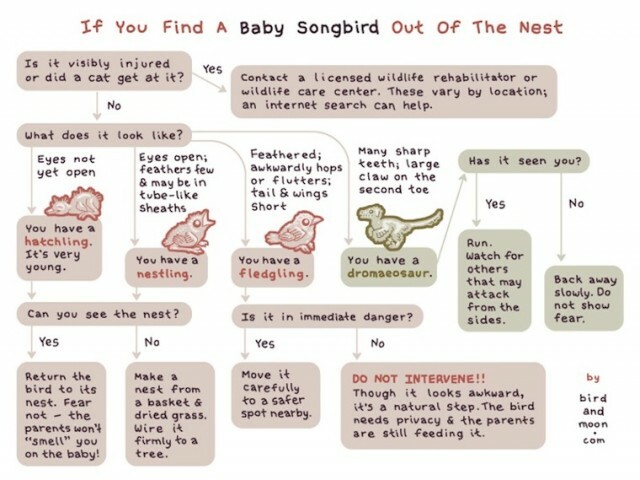 If the baby isn’t injured (no cuts, nothing broken, a cat didn’t get it) you can try to put it back in the nest. If a cat got to it, it needs to be brought to a rehabilitator immediately, as cats carry bacteria that can cause fatal infections in many wild animals. If the bird is injured, call a wildlife rehabilitator for help and instructions. The best chance for a baby songbird to survive is with its mother. If the baby isn’t injured, but is a little cold to the touch, you can warm it up in your hands before putting it back in the nest. If you can’t reach the nest, or see where it is exactly in the tree, you can make a makeshift nest. Get a plastic container, like a margarine tub, poke holes in the bottom for drainage, put a warmed rag from the dryer in there, along with some twigs and leaves, and secure the nest as close as you can get to the nest, or where you think the nest is at. You want to place the nest under some branches or some coverage, so it’s not completely unprotected from rain or sun, and it’s not as easily visible to predators. Then put in the bird, and if the mother is still around, she will feed birds at both nests. The mother will take a baby bird that has been touched by a human. Most birds, except for Vultures and Condors, don’t have a good sense of smell. However, you don’t want to handle the baby bird a lot, or you may stress it out, and the longer you keep the baby from the mother, the greater chance that it will be abandoned, or die. You must leave the area, and if you’re in your backyard, go back inside your house to watch for the mother for at least an hour before going to back to bring the baby to a wildlife rehabber. If it is hopping around and looks active and healthy, stay away and leave it alone. If you hang out in the area or try to handle the bird too much, you can attract predators to the bird. Often people will think fledglings have a broken wing or leg because of their hopping around, but unless you see them holding a wing or leg in a weird position, or blood or cuts on the bird, leave it alone. Fledglings are more vulnerable to cats and other predators, so if you have cats or dogs, try to keep them inside or away from the birds until they are able to fly, which takes a few days. If a cat gets the bird, bring it in to a wildlife rehabber, since the bird may have an infection. If you are worried that predators may try to get the fledgling, you can get it and put it in a nearby shrub or low tree branch, but this is just a natural part of wild animal survival. If the fledgling is not injured and not in immediate danger, LEAVE IT ALONE! The parents are nearby, still feeding it while it is learning how to fly. If the fledgling is not hurt but in a dangerous spot, gently move it to a safer, nearby location away from any predators or danger. With precocial birds, people most often find Mallard ducklings in this area. A Mallard mom will lay eggs a few at a time, and fly back and forth between her nest and the water body she is living on with her mate. She doesn’t think about how she will have to walk the babies to that water body when they hatch, so she may make a nest in an area that is enclosed by fences or blocked off by roads. The mother will not sit on the eggs to incubate them till she has laid all of them, so they’ll hatch at the same time. Mallards usually lay about 8-12 eggs, so if you find a nest with less than 8 eggs in it, she hasn’t abandoned the nest, she just isn’t done yet. Once she starts to incubate the eggs, she will only leave the nest early in the morning and late in the evening to get food and water and visit with her mate at their water body. Within 24 to 28 days, the eggs will all hatch within a 24-hour period. She will then walk the ducklings to their water body and get together with her mate. If you find a nest that has more than 8 eggs in it, and you haven’t seen the mother come back within several hours, or you know the mother to that nest is dead, leave the nest alone, the babies are probably dead. If you find an egg out of the nest, it probably is dead. You shouldn’t try to take the eggs home with you to incubate, since it is illegal for people without the proper permits to raise wild ducks. If you think the mother is alive and you are worried she isn’t getting enough food and water, you can buy duck pellets and take a large dish of water and put it near her, but don’t try to disturb her or bother her too often, or she may abandon the nest. If you are worried about the mother Mallard and her nest because they are surrounded by roads, you can try to help. If the nest hasn’t hatched yet, you can watch and keep an eye on the nest, so when the ducklings hatch you help them across the road. Or, a week before you think they’ll hatch, you can construct a 12-24 inch tall wire or mesh fence around the nesting site, making sure the holes are not larger than 1 inch, and the fencing area is wide enough to allow the mother to fly in and out. Then you can move the fence once the ducklings hatch. Only put up a fence if you are watching it daily so you can move it once the ducklings hatch, or they could die. Once you have the ducklings all together, you can put them in a box or pet carrier, and slowly walk to the water body that the mother has been flying to. You want to make sure you are going to the water body she has been going to, since that is where she gets protection from her male. If you take her to another spot, she may walk right out and try to go to the right spot, defeating your purpose. Make sure you walk slow and keep the mother in sight. It’s great if you can grab her too, but she is usually too quick to grab, so just walk with the ducklings and make sure the mother stays nearby, and when you put the ducklings in the water, wait till the mom lands in the water and makes calls, then put the babies in and make sure they start swimming towards their mom. If you see a mother and her ducklings on the move, and they’re heading towards a busy road, you can help chaperone them and make sure they cross safely. Only one or two people should be involved and no children, or you’ll scare the mother away. Move slowly and don’t move the babies anywhere without the mom in the area. If you find a duckling that is separated from its mother, stay away and keep an eye on it for an hour, unless it looks injured or ill, or is in danger. The mother may be nearby and if the duckling is making noise, the mother will come back for it. If the duckling looks injured or is sick, call a wildlife rehabber to see if you can bring it in. You’ll want to put it in a box with newspaper and a warmed towel, and keep it in a dark quiet spot. You can put a small dish of water in with it, but not something too deep that it could accidentally drown in or get soaked and get a chill. If it is near a road, or an animal is nearby that may be hunting it, you can pick it up and put it in a box with a warmed towel. Then, make a trip to the nearest water body, and look to see if you can find any mallards on the water. If you find some, look at the ducklings and see if they are the same size as the duckling you have. If they are the same size, you can try to get the mother mallard to take the baby. If they are not the same size, don’t try it, because larger ducklings will kill smaller ducklings. If they are the same size, you can put the duckling in the water and step back to see if the mother mallard will come over and accept it. If so, it should only take several minutes. If she doesn’t accept it, then grab it and call a rehabber to see if you can bring it in.